Founded over two years ago by former MSU student-athlete and Eli Broad College of Business alum Joe Johnson (BA Finance, ’16) and his wife Megan Johnson, VADE emphasizes convenience by producing the world’s first and only portable protein powder. Scooping protein powder can be difficult and messy, and the packaging makes it impossible to take on the go without pre-mixing or pre-measuring into smaller containers. To solve this problem, the Johnsons did away with typical protein powders’ bulky design and lack of prepping ease. Each VADE packet contains a single serving of high-quality protein powder wrapped in a food-grade film that dissolves in liquid in 3-4 seconds for easy mixing and transport. “Shark Tank” is a reality show on ABC that features entrepreneurs as they pitch their startups to “shark” investors in the hope of earning financial and resource investments. The popular show will feature VADE Nutrition and its patent-pending products in the seventh episode of its 10th season. Joe Johnson began utilizing MSU’s vast resources for student entrepreneurship during his junior year of undergraduate study. His entrepreneurial spirit and talent sparked several ideas for startup companies, many of which he developed through the help of Spartan Innovations and the MSU Hatch. 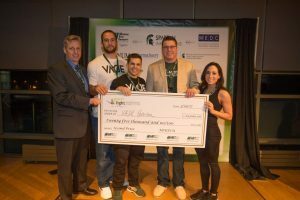 The knowledge and skills he gained through these ventures prepared him to develop VADE Nutrition into a successful startup company that won the Lansing Area Economic Partnership’s Hatching competition in March 2016, a $25,000 prize in 2017’s GreenLight Business Model Competition, and Smart Health’s Top 10 CEOs in Healthcare Award in 2018. As the company continues to grow, Joe Johnson hopes to use his expertise to provide guidance for future MSU student entrepreneurs. VADE Nutrition’s current products include vanilla, chocolate, and combo pod packs along with 28-ounce shaker bottles, all of which can be purchased on their website at vade-nutrition.com.